Today Argentina defaulted on its external debt for the 8th. time since 1800 AD. 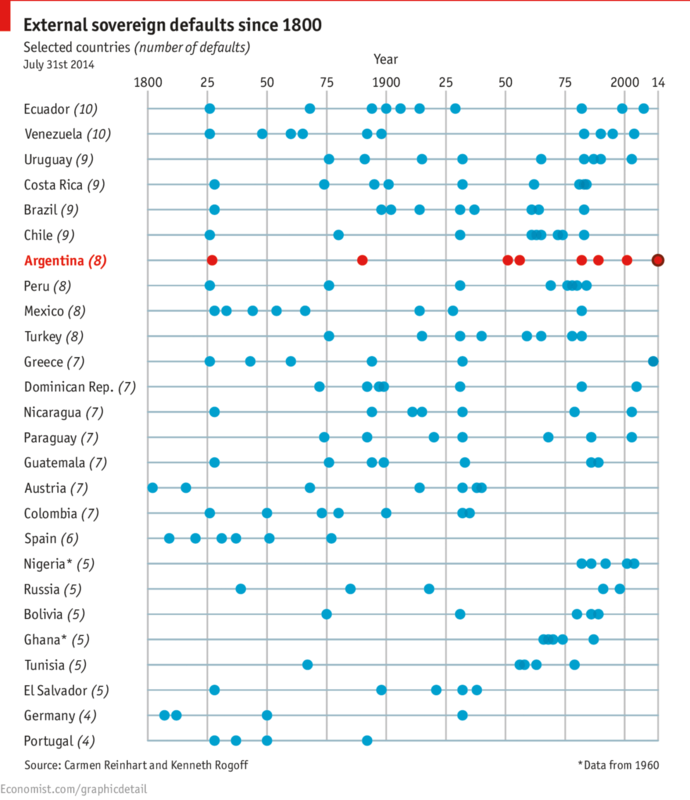 The Economist publishes this chart ranking countries on the criteria of how many times they have defaulted on their external debt in the last 214 years. Curiously both Germany and Portugal have defaulted 4 times. Nothing seems to last (or have been) forever. While the war in Gaza goes on under the effects of the israeli Protective Edge operation (the latest in a series of operations undertaken by the Israeli Defence Forces (IDF) in Gaza in recent years).and the Hamas rocket shelling of israeli towns, two university classmates Abraham Gutman and Dania Darwish have launched the campaign #JewsandArabsRefusetobeEnemies. Gutman is a 21-year-old Jewish Israeli, while Darwish is a 23-year-old Muslim. The campaign launched in Twitter has gone viral (it can also be accessed at Facebook) and aims to underline the basic human nature of both Peoples and that there is no fundamental reason why they could not live together, in peace and fairness. Perhaps if, on one side, the messianic dream of Eretz Israel was abandoned and, on the other, atavistic hate was extinguished, the objective of the campaign would have a chance. As things stand, it is unlikely, but not less praiseworthy for trying. Armstrong Economics and The Guardian both report of the latest breakthrough in anti-eavesdropping, anti-NSA technology: the typewriter. Depending on how old you are, you might not even have seen, much less used, one. Well, it is a device that allows you to type letters, documents, in a non-electronic environment, the way it was done well into the 1960s, a device that, until the NSA finds an AI-based way to detect subtle changes in air pressure caused by fingers typing a continent away might be the best solution for those that need to share sensitive written information and who, at the same time value privacy, an endangered species, unfortunately. Typewriters in, America’s prestige out.